"Edamame (green soybeans), corn, cherry tomatoes and black beans combine to make a colorful salad with a light lime vinaigrette dressing." In a large serving bowl, whisk together the red wine vinegar, grapeseed oil, cilantro, lime juice, sugar, salt and garlic. Set aside. Bring a large pot of lightly salted water to a boil. Add the soybeans and boil for 3 minutes. Add corn to the boiling water and continue cooking for 1 more minute. Drain very well, and pour into the bowl with the dressing. Gently mix in the cherry tomatoes, green onions and black beans. Cover and refrigerate for at least 2 hours before serving to chill and blend the flavors. 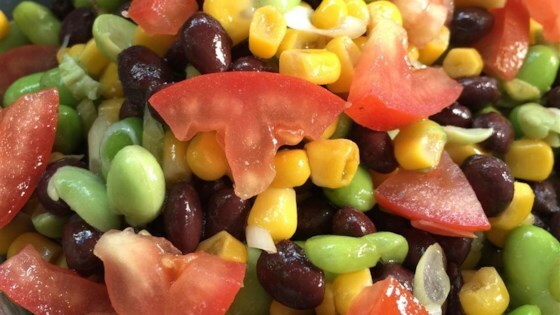 This colorful, healthy salad stars black beans, corn, tomatoes, and edamame. This salad is positively divine! I couldn't find edamame, so I used chickpeas. I also used honey in place of the sugar. I suggest making this the day before serving. Great taste, easy to make ahead and very good as leftover. I used olive oil in the dressing and added a little crumbled feta cheese. I took it to a party and everyone loved it! i am in love with this recipe. it's always delicious and it gets better over a couple days in the fridge. my only substitutions were red onions, instead of green.